Anyone who regularly watches television would be hard-pressed to think of a recent program with greater potential to be a complete garbage fire than FX's American Crime Story: The People v. O.J. Simpson. The salacious media frenzy surrounding the murders of Nicole Brown Simpson and Ronald Goldman, and the subsequent circus that was the trial of O.J. Simpson for those deaths so readily makes for purely sensational television that it's a minor miracle this star-studded effort didn't fall into a tawdry made-for-television movie (or worse) trap. Instead, the series became a surprisingly well-crafted, often-thoughtful look back at an event that now feels like a cultural off-ramp responsible for the redirection of so much of the media we consume today. Despite all the strikes seemingly against it from the get-go – the worrisome involvement of Ryan Murphy, the casting of John Travolta as Robert Shapiro, the evident attention that would be paid to Robert Kardashian (David Schwimmer) and his soon-to-be famous brood – the series proved over its 10-episode run to be a solid, compelling examination of the now 22-year-old "Trial of the Century." Moreover, it the examination a consistently entertaining, utterly watchable event that might be the most surprisingly successful bit of television 2016 has to offer. 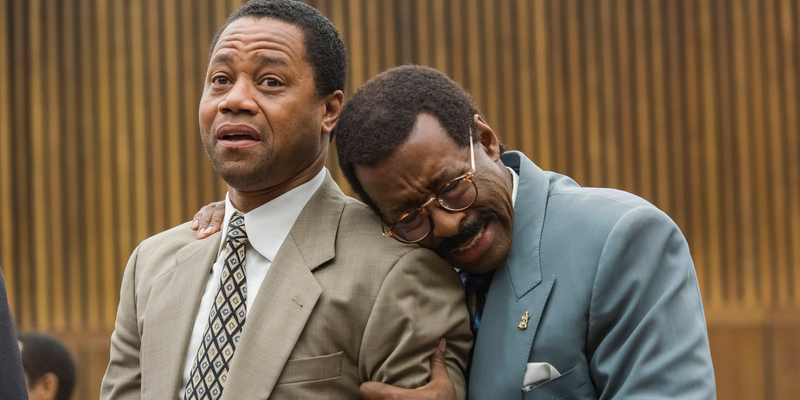 As viewers have seen throughout the past nine episodes, The People v. O.J. Simpson managed its consideration of the trial by not examining the guilt or innocence of the man standing accused of a heinous act of double homicide, but rather by adroitly directing traffic as issues of race, celebrity, community, and class all converged on the Los Angeles County Courthouse at the same time. And in the spoiled-by-history finale, rather than eschew all to capitalize on the breathlessness as the nation awaited the verdict, the series turns its focus inward to see just what a strange monster the trial had become. Simply titled 'The Verdict,' the finale of what – given the tremendous ratings – is likely FX's newest hit anthology series, perhaps should have been titled 'American Crime Story: Emotion v. Logic' as the hour demonstrates early on the divide in the case against O.J. The closing arguments once again offer a showcase for all three actors involved. Sarah Paulson and Sterling K. Brown are brilliantly all business; the arguments of Marcia Clark and Chris Darden are as much a plea to the jury to overlook the preventable ways in which the case had been botched by the prosecution as they are an appeal to the jury to simply apply logic and to look at the facts. By comparison, Courtney B. Vance is the embodiment of human emotion, as he once again brings his A game to deliver another fiery Johnnie Cochran argument. Watching Vance after Darden finishes his remarks is like watching a dormant volcano erupt suddenly. Cochran's closing arguments are simply more proof of how convincingly Vance stole the show. This time, Vance's blustering Cochran engages the audience with the entirety of his voice and his body, knowing the more animated he is the more effectively he will make his emotional appeal, and the easier it will be to convince the jury the trial was about so much more than the lives of two innocent people. Emotion vs. logic is a simple binary that helps explain the decision reached by the jury in an astonishingly short amount of time, but the intent of 'The Verdict' is to go beyond the binary and to observe – and sometimes comment on – what the case had morphed into, to illustrate the ways the O.J. trial was and was not more complicated than it appeared to be. It's the same approach the series took with its cast of real-life characters, choosing to explore their multitudes as a way of looking for the humanity in everyone – even when, by virtue of the accusations against them, there might be none. This is perhaps most evident in how the series explored someone like Cochran, to see him as not just another character, and to depict him as more than a fast-talking lawyer with a penchant for alliteration. Fittingly, once the verdict is read, the series shifts gears and rides the remainder of its runtime through the emotional responses of everyone from the prosecution to the defense to the victims' families to O.J. himself. Gooding has been marinating as Simpson for weeks now, and the moment he's set free there's an ironic sense of freedom in his performance. It's comparable to the O.J. that was seen in 'The Ride of His Life' – a man who wants to escape his circumstances, who wants to crawl out of his own skin. The same can be said for Schwimmer who, over the past few weeks was tasked with illustrating Kardashian's painful realization about his friend through a series of increasingly downcast expressions. When the two meet up after Simpson is released, it is perhaps the most palpable moment of how much everything changed over the course of the trial. Over the course of the season, The People v. O.J. Simpson was surprisingly serious and attentive in its consideration of a complicated story. It was also sometimes very broad and heavy-handed. It was sometimes uneven in its approach, and gaudy in its stylistic choices – especially some of the music cues that put too fine a point on key moments, like the Dream Team's entrance into courtroom early in the trial – or its luxuriating in the defense's skullduggery to give their client every possible advantage. But even when the series seemed to stretch too thin or to compromise its position as something entertaining and maybe even worthwhile, it pulled back and reoriented itself. This level of self-awareness and recognition of the line – and its ability to cross it, so long as it promised to double back – made for an exhilarating examination of a story many feel they know inside and out, because they too were watching it live the day the verdict was read. As far as kicking off a new anthology series goes, FX couldn't have hoped for a better outcome. American Crime Story will continue with season 2 on FX.